There seem to be many different ways to make a sourdough starter. Some use things like grapes and yogurt, others start with brewers yeast and all manor of fancy flours. I simply used strong flour and water to make mine, and that seemed to work just fine. I have since topped it up with a mixture of flours (wholemeal, spelt and rye included) and even the occasional swig of beer. All these things seem to have added to the flavour and texture. I am not suggesting that this is the only right way to do this, this is just the method that I used and it worked really well for me. 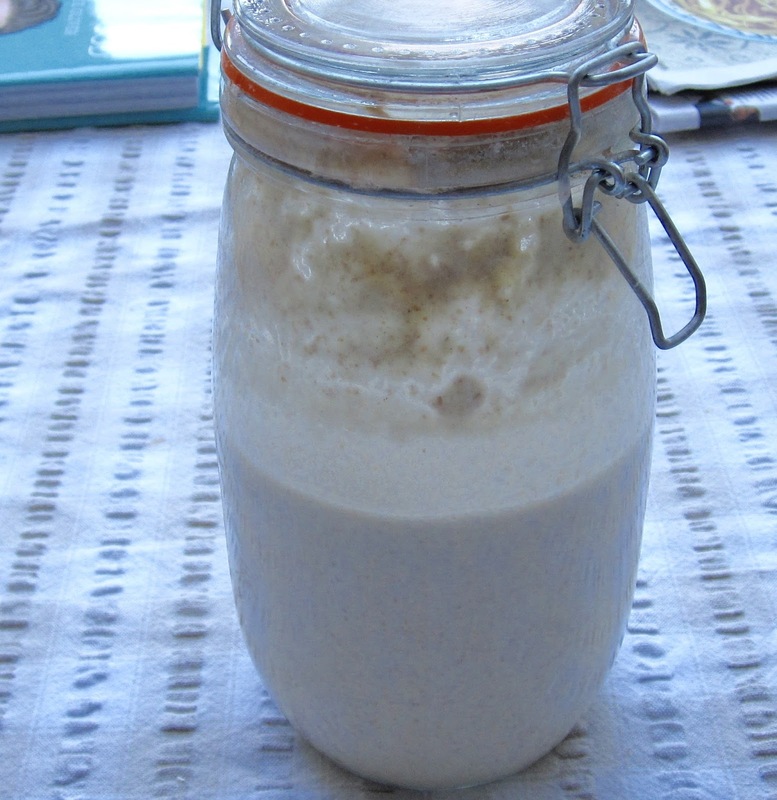 To make your starter you will need a Kilner jar (or something with a similar fastening, don't use a screw top jar). Start by adding 50g water and 50g of strong flour to the jar. Mix the flour and water together until they form a paste. Close the jar and leave at an ambient temperature. Repeat this process for ten days! After the ten days your starter will be ready to use. When you have taken out what you need, place the starter in the fridge. It has been suggested that you can leave your starter in the fridge, untouched, for up to two weeks. However, I have left my starter for about a month and with a little coaxing, it seemed to work just fine. When you next need to use your starter you will need to take it out of the fridge and 'feed' it with 100g of strong flour and 100g of water. Leave it for 6 to 8 hours at room temperature until its starts to go bubbly and slightly foamy. This could take a little longer than 8 hours, so if you don't think it looks quite ready then just leave it for a couple more hours. I have found that it is quite hard to kill your starter, so if you are ever worried that it isn't working, put it somewhere slightly warmer (a windowsill or near a radiator) and give it some time and it should be fine.